PUBG latest Update Out Now on PC .Update Number 15 Includes the game's third map ,Sanhok as well as a New firearm ,an event pass and a Mini Royale matchmaking playlist . 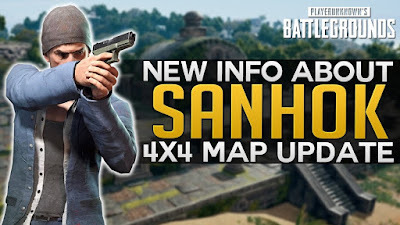 Sanhok is the smallest map as compared to other two maps .It only a fourth the size of the other Two Maps .Despite its smaller size ,the map still features 100 players .The blue zone on Sanhok also behaves differently .It Checks how many players are left befire adjusting both the wait and travel time .The circle size itself does not change ,but the zone will ensure no players get a major advantage . Sanhok features 6 Major locations .Underground caves hide archaeological sites and massive amount of loot . They can be reached by boat or via parachuting through the open top .Ruins offer claustrophobic close quarters combat for any players willing to be sneaky .Sniper will enjoy posting up at the paradise Resort , but the building's corridors offer opportunities for shredding enemies with shotguns and SMGs .The Training Center and Docks are all open battlefields that hide less valuable weapons and items . The SCAR-L is being replaced by a New weapon on Sanhok :the QBZ95 .This assault rifle takes 5.56 rounds and hold 30 shots a magzine .you will want to find a silencer for the QBZ as this gun is loud . PUBG on PC will now have two separate matchmaking playlist . The first Battle Royale will contain the Old Erangel and Miramar maps.players who want to play Sanhok than they will be free to play .